How much do pilot's watches cost? Pilot's watches are precise instruments as well as stylish accessories. Originally designed for pilots, they have developed into one of the most beloved types of watches. Breitling and IWC are two of the most well-known producers of pilot's watches. Pilot's watches are best described as large, clear, and functional. These popular timepieces have their roots in the military, which is why they are the perfect example of the 'form follows function' principle. Today, they are one of the most popular watch types, loved by everyone from pilots to executives. Thanks to their simple design, pilot's watches are extraordinarily easy to read. The dial is usually black, while the hands and markers are both white and coated in luminous material. This guarantees optimum readability, even in dark conditions. There has been a uniform standard for pilot's watches since 2012. German manufacturers like Sinn and Stowa have their pilot's watches certified according to this standard, meaning the reliability of their watches has been proven under extreme conditions. Breitling and IWC are two of the most famous Swiss manufacturers of pilot's watches. Watches like the Breitling Navitimer and the IWC Mark XI are famous the world over. The design of the IWC Mark XI has served as the inspiration for innumerable pilot's watches. The Navitimer chronograph went down in watchmaking history with its slide rule bezel. Wearers can use it to make various mathematical calculations, such as rates of climb and descent, speed, and fuel consumption, among others. If you're interested in buying a pilot's watch, you can choose from a large selection of models from different brands. With such an expansive collection, there's certain to be the perfect watch for every budget. More affordable watches under 1,100 USD are available from Breitling. The Breitling Aerospace has the brand's characteristic bezel rider tabs at 3, 6, 9, and 12 o'clock. Inside its case, you will find an incredibly precise quartz movement. It's available for around 900 USD pre-owned. A used Breitling Chronomat can also be had for less than 1,100 USD. You can find numerous pre-owned Breitling watches for between 1,000 and 3,000 USD. Pilot's watches from the French manufacturer Bell & Ross are also available in this price range. Pre-owned pilot's chronographs from IWC cost around 2,300 USD. Three-hand models are available for less than 2,300 USD. IWC chronographs in good condition cost around 2,900 USD. The 857 UTC watch from Sinn is available with or without a pilot's watch certificate. Both versions cost about the same. You should plan on spending about 2,200 USD on a new model. A new chronograph Sinn 103 Ti TESTAF costs around 3,000 USD. New models with a chronograph and GMT function cost around 3,200 USD. You can find Rolex's GMT-Master for under 11,400 USD. The Genevan manufacturer developed the GMT watch in the mid-1950s based on the demands of commercial pilots. The American airline Pan American World Airways (Pan Am) used the GMT-Master as their official watch. 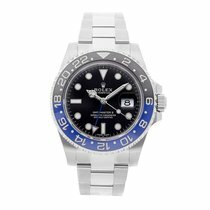 One of the most popular GMT-Master II models comes with a black and blue ceramic bezel and is known as 'Batman.' You can purchase this timepiece for around 11,000 USD in mint condition. Pre-owned examples cost a few hundred dollars less. The GMT-Master II Pepsi, ref. 126710BLRO was presented at Baselworld 2018 and sells for over 20,500 USD. Its official list price sits at 8,800 CHF, or around 9,000 USD. Pilot's watches are especially easy to read. They usually feature black dials with white hour markers and large hands. What's more, the hands and markers are coated in luminous material so that they glow in the dark. Additionally, most models include a triangular marker at 12 o'clock. Minute indices and Arabic numerals for the hours make telling the time even easier. Many pilot's watches come with a chronograph function or even a flyback chronograph. One such example is the Heuer Bund, produced by Heuer in the late 1960s for the German military. While coveted among collectors, these vintage watches are still affordable at around 5,700 USD. The Breitling Navitimer is one of the most famous and popular pilot's watches. This iconic chronograph features a slide rule bezel, which can be used to perform mathematical calculations. The Navitimer is also available with the in-house Breitling caliber 01 with a 70-hour power reserve. This 46-mm version is especially readable. Top models in this collection have an in-house caliber with a split-seconds chronograph used to measure intervals. The Navitimer comes in stainless steel, gold, or a combination of both. IWC pilot's watches are also some of the most highly sought after on the market. Their design set the standard for this watch type. The retro Big Pilot's Heritage models are inspired by historic pilot's watches. The 48-mm edition is particularly large and easy to read. Due to their large crowns, operating these retro pilot's watches is remarkably simple. In addition to the basic three-hand models, the IWC line of pilot's watches also includes chronographs. American watch manufacturer Hamilton also made a name for itself with pilot's watches. In 1904, they became the official supplier of the US Armed Forces. Fourteen years later, they turned their sights upward. Since then, Hamilton watches have taken part in many historic moments, from the first airmail service flight between DC and New York to the first flight from California to Hawai'i. During World War II, the company focused solely on the production of military timepieces. Their pocket and wristwatches saw action from the land and sea to the skies. Since 1945, Hamilton watches have continued to reliably display the time to soldiers and civilians alike. Today, the various models of the Hamilton Khaki Aviation collection continue this tradition in affordable style. Many new pieces can be found for under or around 500 USD, while limited editions can cost upward of 3,000 USD. Depending on its condition, vintage timepieces can range from under 100 to several thousand USD for bomb timers or the extremely rare Hamilton "Count-Down" GMT Chrono-Matic. The Cartier Santos is considered the first pilot's watch. Louis Cartier developed this square wristwatch in 1904 for the Brazilian aviation pioneer Alberto Santos Dumont. Two years later, Dumont flew the first official flight in a motorized airplane. During the flight, he wore the Santos, allowing him to keep both hands on the controls while still keeping an eye on the time. The roots of modern-day pilot's watches go all the way back to pocket watches — or, more accurately, deck watches used in high-sea navigation. These were portable pocket watches that supplemented a ship's marine chronometer. The marine chronometer was anchored to the ship and mounted on three freely moving axles, keeping the dial face up even during heavy swells. In this position, the highly precise marine chronometer was regulated, and sailors used it to determine their exact location. During long trips at sea, watches accurate to the second were indispensable for navigation. The officers on board synchronized their deck watches with the marine chronometer and returned to the deck to determine their position via sextant. The deck watches had very precise movements, but due to the extreme deviations in temperature and different positions, they weren't as precise as the marine chronometer. At the beginning of the 20th century, pilots used these deck watches during flights. They would solder metal pieces to the watches and loop thick leather straps through them. When modified this way, they could wear the deck watches on their thighs or over a flight suit. These pilot's watches were easily identifiable by their large crowns, which also allowed the wearer to set the time with gloves on. Later, deck watches received their characteristic pilot's watch design. A black dial with yellow numerals became a defining feature of these timepieces. At the beginning of the 20th century, manufacturers started using the luminous, radioactive material radium. Today, they use the luminescent, non-radioactive material Superluminova. Black dials have some obvious advantages: There's no glare, and together with luminous indices and hands, they are easy to read at twilight and at night. Most pilot's watches from the early 20th century also featured a stop-seconds mechanism. This allowed the wearer to set the watch to the exact second, which is necessary to navigate accurately. One of the most important German manufacturers of these types of watches was the Glashütte-based company A. Lange & Söhne. During the Second World War, they produced pilot's watches exclusively for the military. These watches are very rare today. Just as rare are German pilot's chronographs, which were produced by manufacturers such as Tutima and Junghans. The movements powering these watches originally came from Glashütte. Altogether, there are only 300 to 400 of these vintage watches remaining from the 1930s and 40s, and they cost upwards of 34,000 USD each. The IWC Mark XI is a classic pilot's watch. The Swiss manufacturer IWC produced the watch starting at the end of the 1940s. The Mark XI was a smaller version of the Mark X. For around 30 years, IWC delivered the Mark XI to numerous air forces around the world. This simple, manual watch featured no chronograph function. Therefore, it was comparably inexpensive at 350 Swiss francs. Now, it costs between 5,700 and 10,300 USD. The watch had a characteristic black dial with bright luminous numerals and a triangle at 12 o'clock. To this day, manufacturers such as Fortis still produce pilot's watches with this simple, iconic design. An official standard for pilot's watches has existed since early 2016: the German DIN 8330. The watch manufacturer Sinn Spezialuhren initiated the process of developing this standard. The German Institute for Standardization (DIN) decided in the summer of 2013 to create a new standard for pilot's watches based on the Technical Standard for Pilot's Watches (TESTAF). This standard is oriented to meet the challenges of modern aviation. The aerospace engineering department at the Aachen University of Applied Sciences developed the TESTAF together with Sinn Spezialuhren in 2012. According to DIN 8330, pilot's wristwatches must be compatible with other onboard instruments, pose no risk to the aircraft and crew, and must be able to withstand the physical stressors of flight. DIN 8330 differentiates between visual flight rules (VFR) and instrument flight rules (IFR). Watches certified according to IFR require a stopwatch function and are thus chronographs. Watches certified to VFR have a 12-hour as well as a 60-minute display. The central second hand must feature a mechanism so it can be stopped to the exact second. Furthermore, the standard requires the watch to have a bidirectional rotatable bezel with minute markers and ratcheting. The dial and scale background must be matte black, and the diameter of the dial must not be smaller than 27 mm. The watch has to be easily legible, and thus the hour indices, triangular marker on the bezel, and the hour, minute, and second hands must be coated with luminous material which glows for at least three hours. The DIN 8330 also requires pilot's watches and their functions to work properly between -15 °C and +55 °C (5 to 131 °F). They have to pass an impact test by surviving a drop from a 1-meter height onto a hardwood floor. They are also tested for waterproofness according to DIN 8310. The watches undergo further tests for precision, strap fittings, and magnetic field resistance, among other things. At the end of the tests, the watch must still function properly and have no signs of external damage.